Clonliffe Harriers was founded in 1886 by a group of friends with an enthusiastic love for the sport of cross country running. The club was founded at a meeting held in the back parlour of a house known as ‘Knotts Cottage’ on the Richmond Road, Drumcondra in the city of Dublin. The founding members were Joseph Ingram, Thomas Fitzpatrick, Sam Warrey, Harry Warrey, Ben Pearson, John Thomas, Charles Webb and Fred McKittrick. It was originally intended to call the club the Richmond Harriers, however, there was already a club of that name in existence. The founding members on the basis that the Clonliffe Road ran parallel to the Richmond Road and furthermore as Joseph Ingram lived on Clonliffe Road, decided to name the club Clonliffe Harriers. The club’s first captain was P.J. Byrne who was captain from 1886 until the turn of the century. Three years after the club’s founding the club made its first move in moving its headquarters from ‘Knotts Cottage’ to number 18 Richmond Road. In 1891 Clonliffe commenced an annual club 2 Mile Road Race, this club race eventually became an open road race and this is a race which continues to this day on its way becoming the oldest road race in Ireland and is now recognised as the fourth oldest continuous race in the world. The club’s first President was Mr. M. Butterly who was appointed in 1893. The club enjoyed it’s first national success in 1895 with the winning of the Irish National Junior Cross Country Championship with a team of W. Allen, H. Temple, R. Treach, P. Ewing, J. Murtagh, G.F. Walker, G.F. Matthews, R.D. Gwynne, P.J. Lonergan and S. Warrey. 1896 saw the introduction of the first club race: The Vice President’s Cup which was presented by Mr. C.J. Doran, the then vice president, this was a cup which was to be run during the course of the cross country season and was to be run on a handicap basis. In that first running of the Vice President’s Cup there were sixteen starters. The race was won by T. Clarke, second was T.M. Hennigan, 3rd S.J. Coates and 4th S.J. Warrey (one of the founding fathers of Clonliffe Harriers). The scratch man and fastest time in a time of 27 minutes 15 seconds was L. McArdle who placed 6th overall. At the turn of the century Mr. M.C. McMahon was club President from 1899 until 1901. The club’s activities continued to grow. In 1907 Clonliffe held a four mile flat race at Clonee in Co. Dublin for the McDonald Cup presented by JJ McDonald. It would appear that this was a one off race which was won by a Mr. J. Ironmonger (the McDonald Cup did not resurface again in Clonliffe history until the early 1980s when it was found in a house clearance). In 1908 the Horan Cup was held for the first time, this was a trophy presented by the then vice President of the club Michael Horan Esq. From the seventeen starters that first year, the winner was T. Hassell, 2nd IE Ronan, 3rd JT Graham, 4th J. Bracken with the fastest time recorded by H. Mullally with a time of 38 minutes and 7 seconds. The Horan Cup is still competed for on an annual basis to this day. Later that year the club relocated to new headquarters situated at Old Gate beside Glasnevin Cemetery. The club availed of changing rooms above the licensed premises of John Kavanagh (‘the Gravediggers’). In 1908 Clonliffe Harriers produced its first Olympians when a trio of Clonliffe men took part in the 1908 London Olympics representing Great Britain. 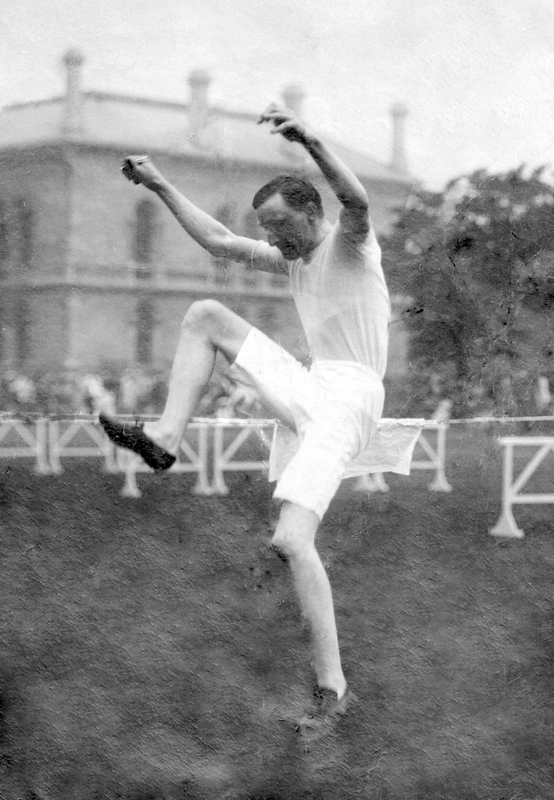 George Mayberry, who later became President of the club competed in the triple jump, Jack Reid, a three time Irish AAI Champion in the three mile walk, competed in the 3500m walk and Joseph Deakin. Deakin had been Irish Mile and 4 Mile champion in the Clonliffe colours whilst posted with the British Army in Ireland, he returned to England in 1903 where he joined Herne Hill Harriers and at the London Olympics he ran the 1500m qualifying for the final where he finished 6th in a time of 4.07.9. The following morning he led the British team to gold medal in the three mile team race. Legend has it that that afternoon after a celebratory champagne lunch he lined up for the heats of the Olympic 5 Mile competition. Unsurprisingly he is recorded as ‘DNF’!. In 1910 the club President was Mr. G.F. Walker. Legendary Clonliffe club captain Tommy Burton (he was club captain for a remarkable 41 years from 1905 to 1946) led the club to its first Irish National Senior Cross Country Championship with a team of J. Malone, C.F. Rothwell, CV Gross, JJ Higgins, M. Wilson, J. Quigley, FJ Ryder, TJ Downing, D. Parker, G. Johnston, P. Kelly and S. Pearson. A further club race was introduced in 1910, the Grand National, a 6 mile cross country race, the winner that year was C.G. Wisdom, 2nd was the Scratch man T.J. Downing (he recorded a time of 33 minutes and 5 seconds) and 3rd was Mr. A. Morton. In 1911 a team of T.J. Kelly, T. O’Neill, A. O’Sullivan, C.V. Gross, H. Rylands, F.J. Ryder, B. Parker, J. Comerford, P. Kelly, C.F. Rothwell and S. Pearson were crowned Irish Southern Cross Country Champions. The club produced more national champions. In 1912 Mr. J.M. Hill was Irish Half Mile Champion and then in 1914 H. Carmichael Irwin won the National Cross Country Championship. At the 1912 Olympics Clonliffe were again represented. Timothy J. Carroll, who was Irish high jump champion from 1912 to 1914 and again from 1919 to 1923 competed in the 1912 Games representing Great Britain where he finished joint 9th. He also competed in these games in the triple jump where he finished 19th. His personal best in the high jump was 1.95m which he set in 1913 in Kinsale, a height which would not be beaten by an Irish man until 1954. At the 1920 Olympics in Antwerp Anthony Carroll again represented Great Britain in the high jump where once again he placed 9th. Carmichael Irwin also competed at these Games, again representing Great Britain where he competed in the 5000 metres. He finished second in his heat in a time of 15.17.8 qualifying for the final where he finished 12th. In 1921 he was Irish 1 Mile and 4 Mile champion with a mile PB of 4.33.6 and 3 mile PB of 15.15.6. Carmichael Irwin was a member of the RAF, he was captain of the Airship R. 101, which tragically the airship crashed on its maiden voyage at Beauvais, France on the 5th of October 1930 killing Carmichael Irwin and all the crew and occupants of the airship. In 1932 the club’s members subscribed for a cup to be presented to the winner of the club 6 Mile Grand National Race in memory of Carmichael Irwin and the race became known as the Irwin Memorial Cup. A race which continues to this day. This decade also revealed another truly outstanding athlete by the name of Norman McEachern an 800 metre runner. At the 1924 Tailteann Games held at Croke Park he defeated an international field to win the 880 yards in a time of 1.56.8. That year he represented Ireland at the Paris Olympic Games in the 800 metres finishing 2nd in his heat and qualifying for the semi-finals where he was eliminated placing 5th. He became a two time Olympian when selected to run in the 1928 games in Amsterdam, again he qualified for the semi-final, however, is recorded as a ‘DNF’. The previous year he broke the Irish 880 yards record at an international Meet at Fallowfield running a time of 1.53.5. 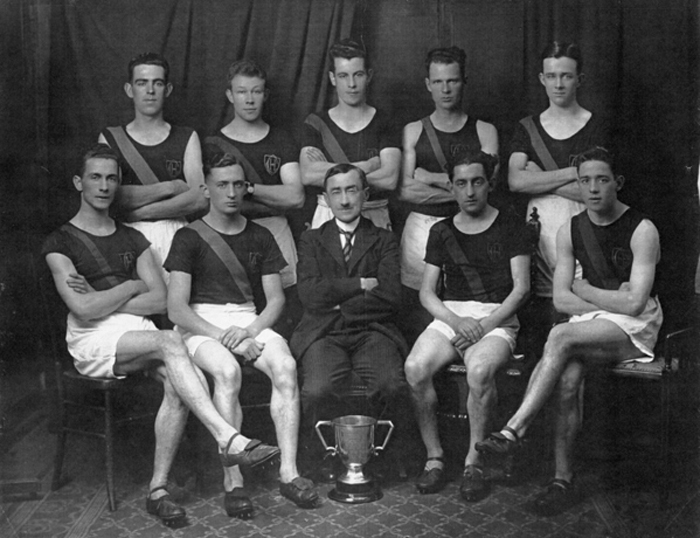 The club’s success continued to flow with the winning of another National Senior Title in 1925 with a team of D. Galavan, C.P. Kenna, G. Wisdom, J.T. McCabe, D. Dunne, B.H. Bingham, C.C. Walker, C.N. Walker, A.P. Walker, A.J. Cassidy and C.F. Rothwell. The following year Billy Bingham was National Individual Cross Country Champion. By this stage additional club races had been introduced including the Farren Cup ‘point to point race’. 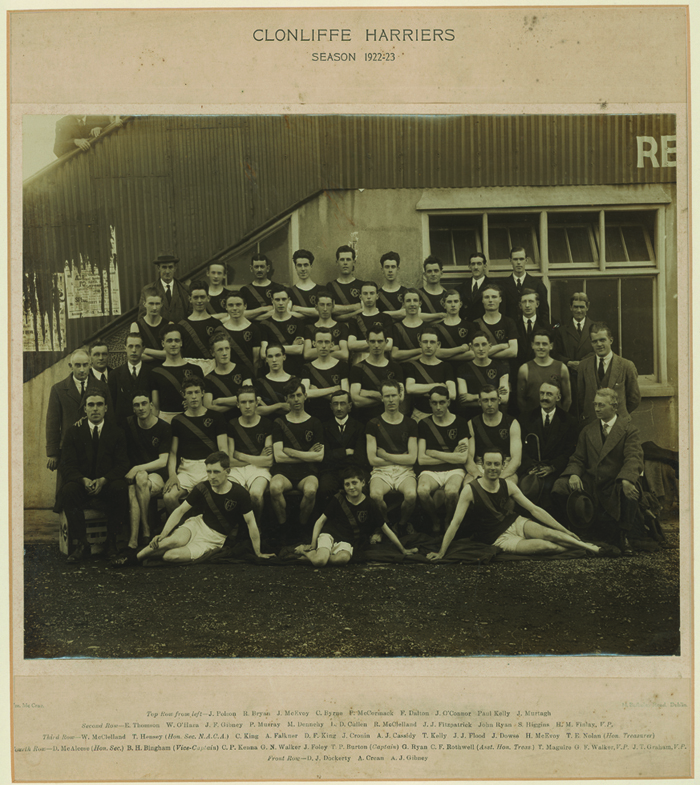 The club also promoted an annual Clonliffe Harriers sports which attracted international athletes including in 1928 Jack London, the 1928 Olympic Silver Medallist, he ran the 100 yards flat at the Clonliffe Sports in 1928. At that same Sports an invitational mile relay was held (a 4 x 440 yard relay) which was won by South London Harriers in an Irish all comers record of 3 minutes 29.4 seconds which remained an Irish record for well over 50 years. These annual open sports took place at various venues including Croke Park and Ballsbridge. At the commencement of this decade J.J. O’Connor continued to dominate cross country running nationally, he was a four times individual cross country champion, between 1929 and 1935. In 1935 for the first time the name of W. Morton – Billy Morton – appears in Clonliffe’s history. The 1935 Dublin Junior Cross Country co winners were P. McCormack, P. Higgins, H. McCarton, F. Burke, P. O’Hara, H. Cooney, an individual who would also leave his considerable mark in Clonliffe, S. Gray, W. Morton and J. Foley. In 1936 Billy Morton was Irish Marathon Champion in a then Irish National record of 2 hours 47.28. The club had moved to another home at this stage in Finglas at Barn Park and was the first cross country club in Dublin to have its own headquarters. The club’s reputation as a producer of fine international athletes blossomed For the 1948 Olympics in Londong Clonliffe provided three Olympians: Donegal man Paul Dolan who competed in the 4 x 400 metres relay (four years later he was in Helsinki for the 1952 Olympics), David Guiney in the shot putt and John-Joe Barry ‘the Ballinacurra Hare’ with career PBs of 3:51.4 from 1500 meters and 13.56.2 for three miles. Barry was selected for both the 1500 metres and the 5000 metres. The Irish team manager at these Games was Clonliffe man Mr. C.F. Rothwell, he had been a member of the Clonliffe Irish Southern Cross Country winning team back in 1911 and was President of the club in 1935. 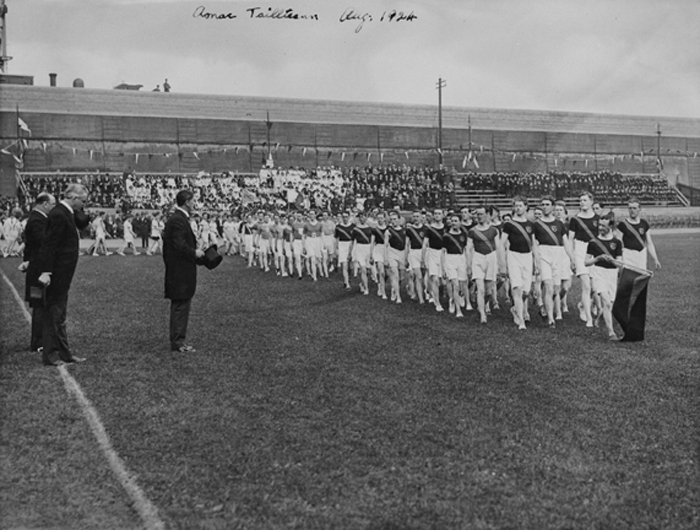 The first Clonliffe 20 was run in 1941 starting in `Balbriggan and finishing at the G.P.O. on O`Connell Street. On the club front the Doran Shield was won outright by E.T. Galway in 1943 having won the event four times in all. Mr. Galway presented the club with a new trophy ‘the Galway Shield’. By 1946 Clonliffe celebrated it’s Diamond Jubilee. The club captain remained Tommy Burton, the club Honorary Secretary was Billy Morton. The club handicap races flourished and during the cross country season club athletes competed for the Vice President’s Cup, for novices, the O’Connor Cup 4 miles flat and Sealed handicap, Sean Farren presented the club with the Farren Cup having won out the McEvoy Cup for the club`s ‘point to point race’, Grand National/Irwin Memorial Cup 6 Mile, Horan Cup, 6 miles flat, Galway Shield, 5 mile flat. During the Summer various club handicaps were competed for on the track ranging from 130 yards up to middle distance races. The club continued to promote an annual sports meeting which were promoted by Billy Morton. These events had an international flavour, the International Athletics Meetings took place at various venues around the city including Ballsbridge, Landsdowne Road and Shamrock Rovers Football Ground in Milltown. Billy Morton had athletes from Ireland, England, Scotland, Wales, New Zealand and Australia taking part. During the 1940s Clonliffe Sports Meetings featured world renowned athletes such as Sydney Wooderson , Roger Bannister, Chris Chataway. 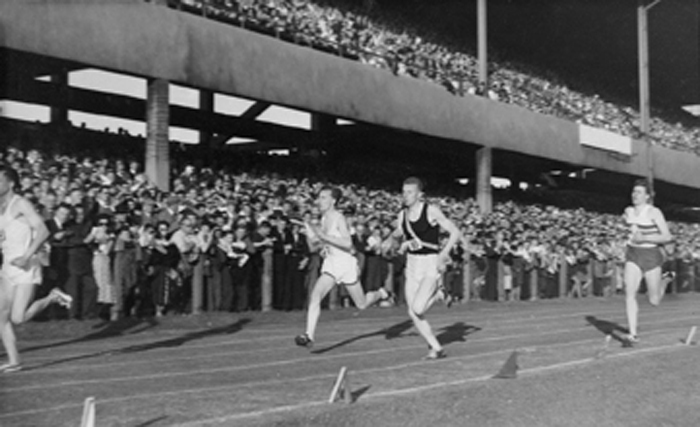 In 1949 the Clonliffe Sports at Landsdowne Road included Olympic Champions Fanny Blankers-Koen of the Netherlands, Harrison Dillard, the Olympic 100 metre champion from the USA before a crowd of no less than 37,000 people. The 1952 Olympic Games were held in Helsinki. Clonliffe had two representatives: Billy Morton was the manager of the Irish Olympic team and in the sprints remarkably Paul Dolan competed in all three – the 100m, 200m and 400m. This was Paul Dolan’s second Olympics having been a member of the 4 x 400m relay squad at the previous Olympics in London. In Helsinki he qualified for the quarterfinals in the 200m where he was eliminated having eliminated in the heats of both the 100 and 400. The 1950s were the golden years of Irish athletics. Clonliffe Harriers continued to flourish, in 1952 Harry Cooney became Clonliffe club captain, a position in which he continued until 1968. Harry continued to compete at the highest level and in 1953 and again in 1955 was Irish National Marathon Champion. In 1952 Sam Gray became the club’s president a position which he held until the end of this decade and beyond until 1963. Also in 1952 Clonliffe held the first flootlit Athletics Meet in College Park. In 1955 the club’s dream to move to it’s own premises was realised. Over the previous decades the Clonliffe Sports had raised considerable sums of money and there was sufficient sums in the club’s coffers to assist in the purchase of property in the North Dublin village of Santry. There the club built a new stadium, initially this stadium was named the Clonliffe Harriers stadium, in the 1960’s it was named the John F. Kennedy Stadium and in latter years following on the death of Billy Morton was named the Morton Stadium, locally the Stadium was known as Santry Stadium. In 1957 Frazer Walker, grandson of George Frazer Walker, a Clonliffe Harrier from 1893 and Club President from 1902 to 1907 was National Marathon champion. The following year he won the Clonliffe 20. The Clonliffe 20 was a race which ran throughout the 1950s, 60s, 70s and 80s. In May of 1958 the club under the stewardship of club secretary Billy Morton replaced the track at the stadium with a brand new cinder track and the Summer of 1958 saw Santry’s Summer of World Records. The first of those records was set on the 9th of July 1958 when Australia’s Albie Thomas, before a crowd of 7,000 spectators set a new 3 Mile world record of 13:10.8. The 6th and 7th of August brought the worlds best athletes to the August International Sports, a two day event jointly promoted between Clonliffe Harriers and Crusaders Athletic Club. Billy Morton attracted the worlds best Milers to Santry, Ireland’s Ronnie Delany, the Olympic 1500 Champion, Herb Elliott, the Commonwealth 1500 metre champion and the world’s best miler, Albie Thomas, Murray Halberg and Merv Lincoln. On the 7th of August unbelievably Albie Thomas set a 2 Mile world record before a crowd of 8000 people running a time of 8 minutes 32 seconds. Murray Halberg then to finish the Summer of World Records ran a 4 Mile world best. 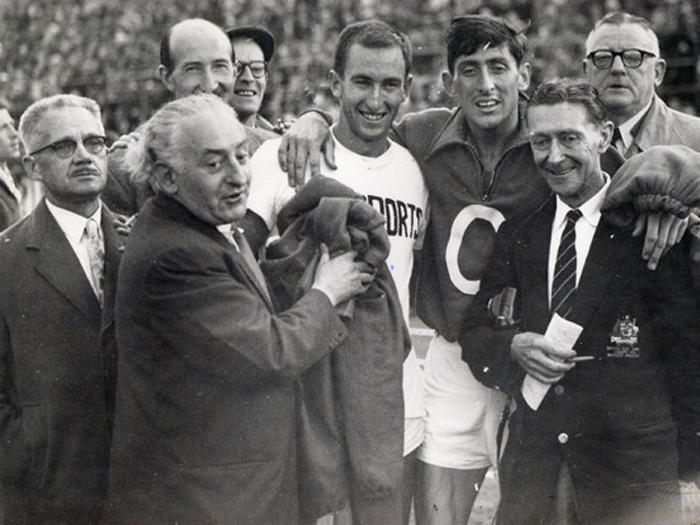 The decade began with the Rome Olympics where again Clonliffe supplied Olympians: Michael Hoey, who had ran in that 1958 world record mile race, ran for Ireland in the 5000 metres where he ran a time of 15 minutes dead finishing 10th in his heat. 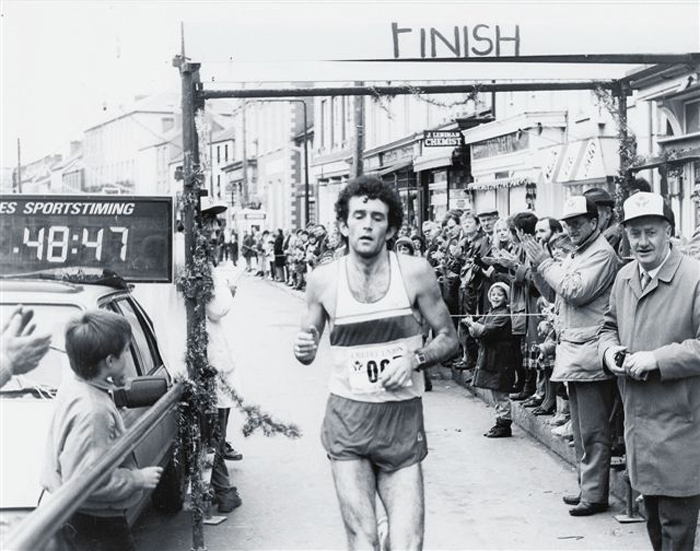 Gerry McIntyre ran in the marathon where he finished 22nd in a time of 2:26:03. At the October 1963 AGM of Clonliffe Harriers A.C. on foot of a motion brought forward by Alec Sweeney for the first time women were admitted to the club and thus the founding of the ladies section of Clonliffe . Over the following decade the club produced some superb women athletes. In the late 60s and early 70s Clonliffe Harrier Claire Walsh was the dominant force in Irish sprinting. She was Irish 100 yard and 220 yard champion in 1968, in 1969 she was Irish 100 metre, 200 metres and 400 metres champion. In 1970 she was Irish 200 and 400 metre champion, in 1971 she again swept the boards winning the 100, 200 and 400 metre National Titles, in 1972 she was 200 and 400 metre champion and in 1973 was 100 and 400 metre champion. Ann O’Brien on the 3rd of March 1968 won the Dublin Cross Country Championship at Santry and later that year was National 440 yard champion. In 1968 she was National 880 yard champion and in 1969 was 800 metre champion. Ann O’Brien was also dominant over the mile and was National champion in 1966, 67 and 68 and in the metric mile was National champion in 1969, 70 and 71. 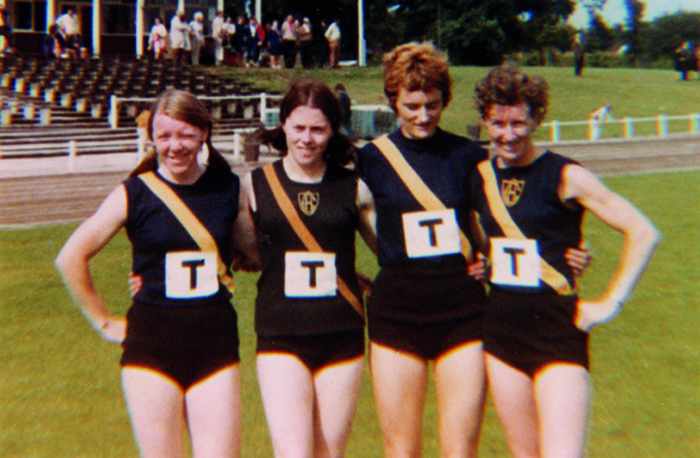 The Ladies also enjoyed team success and were National Cross Country Champions in 1968, 69, 70 and 71. In 1966 a new club race appeared on the calendar – the Walker Perpetual Cup. The Walker Cup was a four mile handicap race and was presented to the club by the Walker family. This was a 4 mile track race in honour of Charles and George Walker who had both been National 4 Mile champions in the 1920s and were both members of the Clonliffe National Cross Country winning team in 1925. Frank Murphy was National Mile champion in 1966 and again in 1967 – both in identical times of 4.09.2 and he was 1500 metre National champion in 1969 in 3.49.8. Frank Murphy represented Ireland at the Mexico Olympics in the 1500 metres in 1968. The following year he achieved his greatest international success and winning the silver medal in the European 1500 metres championship held in Athens in a time of 3.39.51. Also at the end of the decade Des McCormack was dominant over the steeple chase and was National champion in 1969 in 9.22.2 and again the following year. In 1968 Clonliffe with a team of Paddy Killeen, Maurice Ahern and Noel Henry won the first National Marathon team event in Galway. Tragically at the end of the decade, December 15th 1969, Billy Morton died. The club’s first woman Olympian was Claire Walsh representing Ireland at the Munich Olympics in the 800 metres finishing 7th in her heat in a time of 2:08.98, some way short of her 1971 PB of 2.03.4. Frank Murphy was the club’s second Olympian that year taking part in his second Olympic Games in both the 800 metres and 1500 metres. Frank finished 5th in his 1500 metre heat in a time of 3:43.4. In the 800 metres he finished 3rd in round 1 in a time of 1:51.1 qualifying for the semi-finals where he placed 5th in a time of 1:49.2. Danny McDaid became Clonliffe’s third 1972 Olympian finishing 23rd in the marathon in a time of 2.22.25. In the 1970s the club in memory of the legendary Billy Morton introduced an annual Mile race, the Morton Memorial Mile. The first winner in 1970 was double Olympic Champion Kip Keino, in 1976 the race was won by Clonilffe’s Frank Murphy, in 1977 the reigning Olympic champion John Walker of New Zealand won the race in 3.52, the following year Britain’s Steve Ovett won in 3.55.7 and in 1979 the U.S.A.’s Steve Scott was the winner in 3.56.3. Over the years the Morton Memorial Mile was the centrepiece of many a Clonliffe athletics meeting, sometimes the race was the feature of an international athletics meeting and at times the centrepiece of a domestic meeting. On the Cross Country front, the 1970s provided considerable degree of success. At the National Cross Country held in Mallow in 1971 a Clonliffe team of Danny McDaid, Padraig Keane, George McIntyre and Frank Murphy Junior finished runner up, the following year at Clonmel Padraig Keane was the clubs first runner home in 6th place and backed up by Danny McDaid, Brendan Mooney and George McIntyre were again runner up. In 1975 the team placed 3rd. Finally at Ballinasloe in 1976 under the guidance of Laro Byrne the BLE National Cross Country Title was delivered by a team of Gerry Finnegan 9th, Jerry Kiernan 12th, Frank Murphy Junior 14th and Padraig Keane 19th. This success was followed up with another victory in 1977 at Ennis, the scoring four on this occasion being Padraig Keane, Jerry Kiernan, Gerry Finnegan and Tony Murphy. Also on the country in 1978 Kathryn Davis was crowned National Champion, the previous year Kathryn was the 3000 metre National track champion. The coaching success of Laro Byrne was recognised at national level when Laro was appointed coach to the Irish Cross Country team in Glasgow in 1978 where John Treacy won the men’s title. The following year Laro was again at the helm when John Treacy repeated his success at Limerick Racecourse and led the Irish Men’s team home to a magnificent silver medal. Laro was also coach to the Irish Track and Field Team at the European Championships in Prague in the summer of 1978. The club continued to enjoy considerable individual success over this decade producing numerous National champions including Denis Noonan in the 1500 metres in 1974 and Jerry Kiernan the following year. In 1976 Tommy Griffin was national 10,000 metre walk champion and in 1976 Johnny O’Leary was again National 20k road walk champion. With the first running boom in full swing Clonliffe’s membership and activities continued to grow. At the height of the road running boom Clonliffe athletes such as Jerry Kiernan, Eamon Tierney, Padraig Keane, Dave Taylor led the way. On the track Jerry Kiernan was National 10,000 metre champion in 1981 and at the end of the decade Richard Mulligan was the 1989 10,000 metre champion. Under the Captainship of Paddy Marley from 1980 to 1990 the Men’s Cross Country Team were all conquering and during this decade produced remarkable National success. The club were National champions in 1980 (in the Phoenix Park with a scoring four of Gerry Finnegan, 9th, Jerry Kiernan 18th, Denis Noonan 23rd and Eamon Tierney 24th. In 1981 at Ballyfinn the scoring four were Jerry Kiernan 8th, Noel Harvey 9th, Gerry Brady 15th and Denis Noonan 20th, in 1982 in Mullingar the scoring four were Jerry Kiernan 4th, Padraig Keane 8th, Brian Dunne 12th, Gerry Finnegan 14th and at the Rathkeale in 1983 the scoring four were Jerry Kiernan 3rd, Noel Harvey 6th, Gerry Finnegan 20th Eamon Tierney 24th, again in 1984 at Kilmacow the team were led home by Jerry Kiernan in first place, Gerry Brady 13th, Noel Harvey 16th and Denis Noonan 37th made the scoring four. 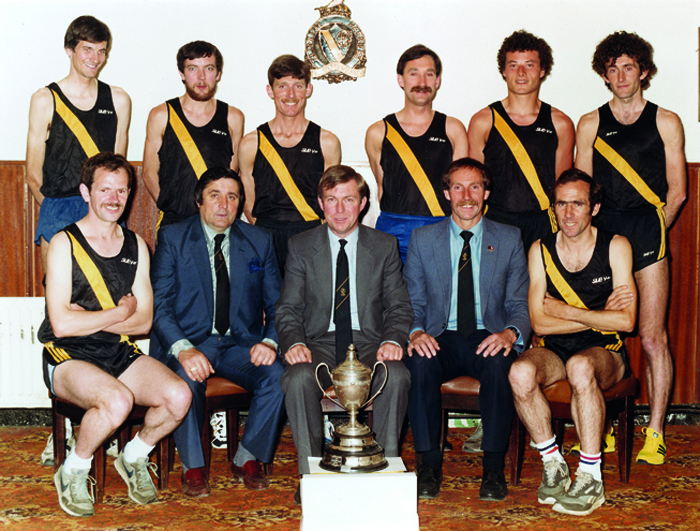 In 1985 back in Kilmacow the winning team were Jerry Kiernan 5th, Jim McGlynn 10th, Noel Harvey 14th and Gerry Brady 16th and in the club’s centenary year as part of the celebrations the Nationals were held in Santry where Noel Harvey led the team home taking an individual win and led the team of Dave Taylor 5th, Eugene Curran 15th and Dermot Redmond 20th to another National win. In 1987 Dave Taylor was first with Jerry Kiernan 8th, Eugene Curran 15th and Eamon Tierney 25th, in 1988 Dave Taylor retained his individual win with Gerry Kiernan 4th, Noel Harvey 24th and Gerry Finnegan 27th making up the scoring four and finally in 1989 the winning Clonliffe team was made up of Richard Mulligan 6th, Jerry Kiernan 9th, Gerry Brady 16th and Gerry Finnegan 28th. At the Los Angeles Olympics in 1984 Jerry Kiernan ran in the marathon where he finished a magnificent 9th place in a time of 2:12.2. The Irish Olympic team coach for these Olympics was Laro Byrne. The club’s centenary celebrations in 1986 commenced with the club cross country championships being held on New Years Day when club athletes old and new assembled on a wet and muddy Santry for a great day’s sport which finished up with the first of many a celebratory beverage in the clubhouse. The National Cross Country was held in Santry that year when on a very frosty February day not only did Noel Harvey take the individual men’s crown, and lead his team-mates home to victory, but Mary Donohoe won the women’s individual title. There was a great turnout of Clonliffe club athletes for the day with the club fielding no less than three teams in the men’s Senior race. The centenary celebrations also saw the return of the Clonliffe 2 Mile race to its traditional venue on the Finglas to Glasnevin Road, the event being sponsored by Mr. Eugene Kavanagh of Kavanagh’s public house, know locally as ‘the Gravediggers’, a place which had featured in the long distant Clonliffe history back in the early 1900s. The club also hosted an international athletics meeting in the stadium and held a centenary dinner in the Grand Hotel, Malahide, Co. Dublin. 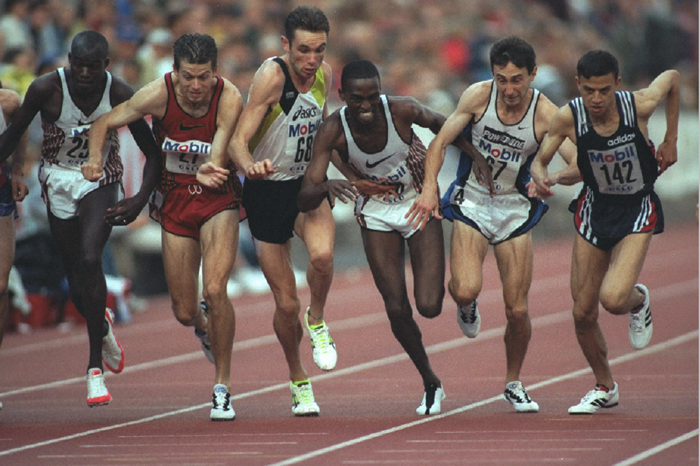 In addition to Dave Taylor’s cross country successes he was also an outstanding track athlete and enjoyed outstanding success this decade, he was National 5000 metre champion in 1986 in a time of 13.50.91 and National 1500 metre champion in 1987 in 3.47.94. 1988 also saw Anne Keenan-Buckley become Clonliffe’s second woman Olympian when she ran in the 3000 metres at the Seoul Olympics where she placed 13th in a time of 9:03.10. Throughout this decade the club continued to promote the annual Morton Memorial Mile which continued to attract the cream of the world’s Milers. Further club races were added to the calendar which included the Michael Murphy Memorial 5 Mile race which took place in the grounds of Malahide Castle. Maurice Ahern presented a trophy for the club’s annual 10 Mile club championship and Pat Bonass presented a trophy for the club’s annual 10,000 metre track championship. The club also promoted an open 5 Mile road race which attracted very substantial fields throughout the 1980s. The club, however, found itself under considerable financial strain and had great difficulty in maintaining the Morton Stadium to the required level and despite intensive fundraising and lobbying for funding the club found itself in a situation where it simply could not continue to maintain the facility and engaged in a discussion process with State agencies to try and lessen the burden and ensure the long term future of the stadium. The Captainship of the club passed from Paddy Marley to Peter McDermott who captained the club throughout this decade. For the majority of the 1990s the club President was Maurice Ahern who remained club President for some 14 years. Success continued to follow at National Cross Country level and only on one occasion in the 1990s did the Men’s team place outside the top 3. The club were national champions in both 1991 (Richard Mulligan, Noel Cullen, Dermot Redmond and Gerry Brady) and 1992, again at Santry (Richard Mulligan, Noel Cullen, Jerry Kiernan, Dermot Redmond). In 1993 Noel Cullen won the individual title at the Nationals held in the Phoenix Park. The club continued to produce National champions throughout this decade, in 1990 Richard Mulligan was again National 10,000 metre champion. In 1991 Bobby O’Leary following in his father Johnny’s footsteps was National 20k road champion. Bobby O’Leary went on to the 1992 Olympic Games at Barcelona. Paddy Marley was Irish Team Manager at these Olympics. The future of the stadium was assured in May of 1993 when Clonliffe entered into an agreement with the State and Local Authority which resulted in the Local Authority taking over ownership of the Morton Stadium with an undertaking to continue to maintain the facility as an athletics stadium (subsequently the stadium became the National Athletics Stadium) and in return Clonliffe received exclusive use of the facility for the prime days of the week. The club also received ownership of part of the stadium grounds where club constructed a fine clubhouse incorporating dressing rooms, showers, a hall and a members lounge bar which opened on the 15th of September 1995. The club continued to produce superb international athletes, most notably during this decade Niall Bruton, from Santry. Niall was World Student Games 1500 metre champion in 1991, he also had victories on the indoor circuit in the United States winning the Wannamaker Mile and in 1996 travelled to the Olympic Games in Atlanta where he qualified for the semi-finals having finished 3rd in his heat in a time of 3:37.42 and finishing 12th in the semi-final with a time of 3:42.88. Niall Bruton was National 1500 metre champion four times in this decade, 93, 94, 96 and 97. In 1996 Clonliffe were the G.V. Ryan winners. On the roads this decade Jerry Kiernan was the 1992 National marathon champion and Eamon Tierney was National Champion in 1994. Veteran’s athletics was also a growth area in the 1990s and a superb vets quartet of Jerry Kiernan, Gerry Brady, Gerry McCabe and Denis Noonan won numerous national vets cross country titles. On an historic occasion the club’s AGM was held at the Mansion House on Dublin’s Dawson Street. The club President Mr. Maurice Ahern was Dublin’s Lord Mayor for the millennium year. At the turn of the millennium the clubs races found a new lease of life with the introduction of the club’s own Grand Prix Series which ensured the continued running of all of the club’s club races with substantial fields running in these club events of up to 60 club members and guests. 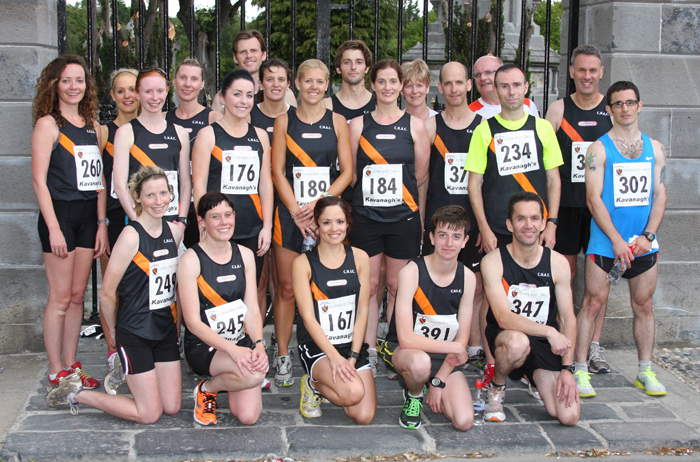 The club’s annual Clonliffe 2 Mile race continued attracting reasonable fields of 100 plus athletes. The club’s juvenile Section under the guidance of Gladys Cooper with her team of coaches grew substantially over this decade with over 100 juvenile members. Club captain, throughout this decade, Joe Cooper, oversaw incredible success with the club winning the National Cross Country title in Alsaa in the year 2000 with a team of Noel Cullen, Cian McLoughlin, Niall Bruton and Nigel Brunton, the following three years the club placed 2nd and in 2004 at Roscommon Racecourse were again national champions with a team of Killian Lonergan, Cian McLoughlin, Paolo Doglio and Rory Byrne, this success was followed up with success for the rest of the decade with seven titles being won in succession – 2004 (Killian Lonergan 5th, Cian McLoughlin 7th, Paolo Doglio 12th, Rory Byrne 17th), 2005 (Mark Kenneally 2nd, Killian Lonergan 9th, Aidan Bailey 26th, Paolo Doglio 28th, 2006 (Killian Lonergan 3rd, Mark Kenneally 6th, Gary O’Hanlon 12th Cian McLoughlin 16th), 2007 (Mark Kenneally 2nd, Killian Lonergan 8th, Colm Rooney 9th, Cian McLoughlin 13th), 2008 (Alistair Cragg 2nd, Chris Cariss 5th, Sergiu Cibanu 9th, Brian McMahon 13th) 2009 (Mark Kenneally 2nd, Chris Cariss 6th, Sergiu Ciobanu 10th, Killian Lonergan 12th). 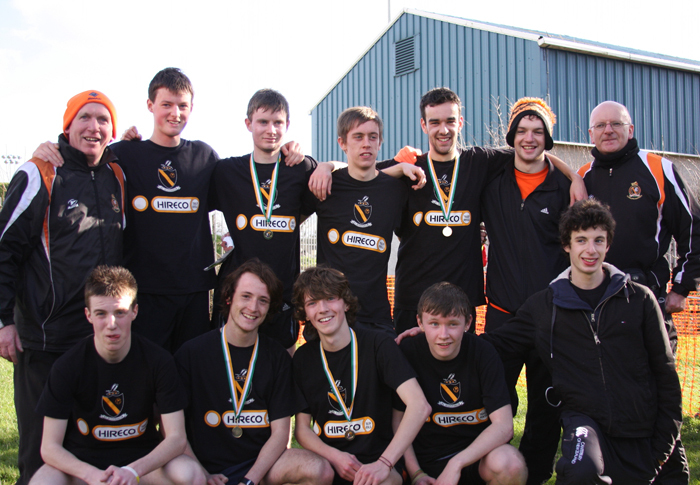 In the National Road Relays success also followed with the Men’s Team being national champions in 2006, 2007 and 2008 and for the first time in 2008 Clonliffe Harriers were National Track and Field Champions. In 2010 in the Phoenix Park Clonliffe had our first individual winner of the Nationals since Noel Cullen in 1993, by coincidence also in the Phoenix Park, when Mark Kenneally was crowned National Senior Cross Country Champion. With Clonliffe’s other scorers: Chris Carriss 8th, Sergiu Ciobanu 9th and John Henegan 15th Clonliffe were again National Champions for the seventh successive year. At the annual National Road Relays the men’s team were champions in 2006, 2007 and 2008. Traditionally the club had been seen as a cross country club, however, all that changed at the latter end of this decade. After being close on a number of occasions to winning the National Track and Field League the team delivered in 2008. 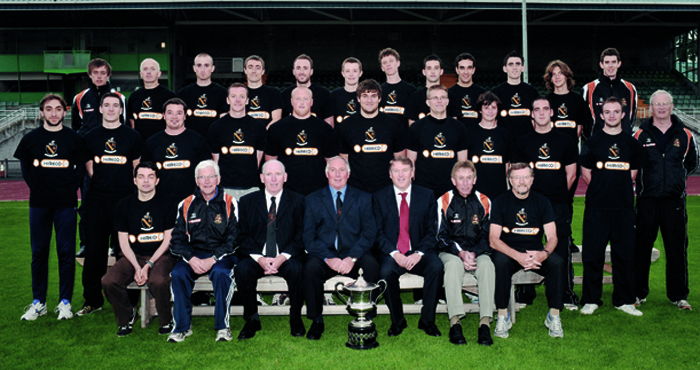 That success being followed up and maintained for the rest of the decade as the Clonliffe Senior Men’s team were National Track and Field Champions in 2008, 2009 and 2010. This success being built on the solid ground provided by the club’s sprinters under the coaching of John Shiels, throwers under the coaching of Bart Rogers and other field events including in particular Clonliffe’s dominance in the pole vault over the course of this decade. Master’s Athletics, formerly Veteran’s Athletics, continued to grow with a number of these Master’s Athletes finding success in international competition at European and World Masters events, Clonliffe medal winners at these championships included Mags Grennan, Richard Mulligan, Jerry Kiernan, Pat Bonass, Noel Guiden, David Brennan and Jimmy Bennett. The club also produced numerous international athletes during this decade, Mark Kenneally, Killian Lonergan and Colm Rooney all ran for Ireland. Alistair Cragg was the club’s most famous international athlete, he was a two-time Olympic finalist in the 5000 metres in 2004 in Athens where he placed 12th and also in 2008 at Beijing when again he qualified for the final, however, injury forced him to drop out of the final. He was also a finalist in the world track and field 5000 metres when he finished 5th in the 2006 finals. He also became the club’s first international track gold medallist when he won the European 3000 metres indoor title in Madrid in 2005 and he was a finalist in the European Championships again over 5000 metres in 2006. In the latter part of this decade Cragg set a national 10,000 record, followed in 2011 by a national records at 5000 metres and over the half marathon distance. 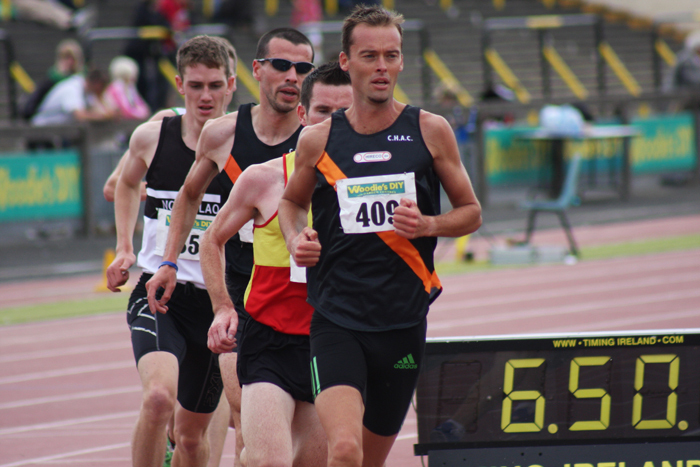 Individual National Champions in the Clonliffe colours this decade included Alistair Cragg winning the 1500 metres title in 2004 and the 5000 metres in 2009. Colm Rooney was the 2008 National champion over 1500 metres. 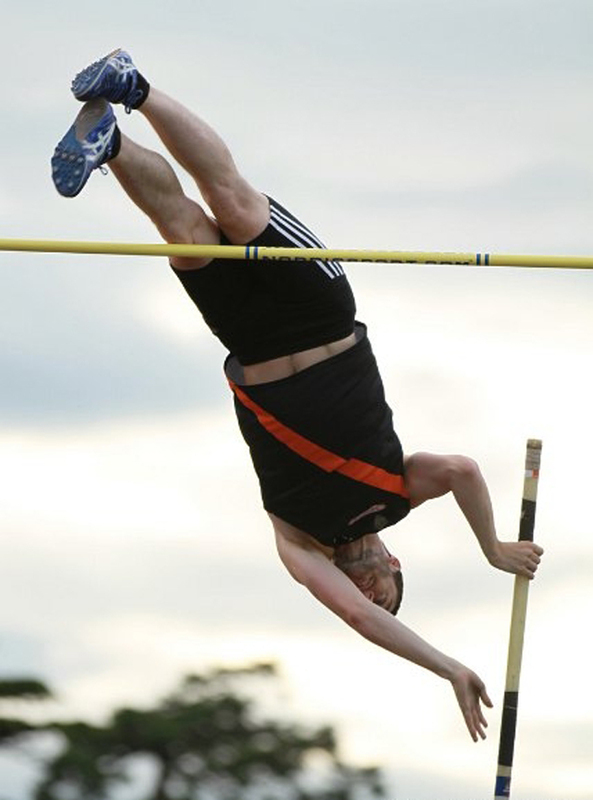 In this decade the club was almost the centre of excellence in the Pole Vault with Clonliffe producing three top class pole vaulters. Ian Rogers who was National Junior and U/23 pole vault champion, Anthony McCreary who was National Pole Vault Champion in 2007 and David Donegan who was the almost dominant force with an almost unblemished record throughout the decade taking a dozen National titles between indoor and outdoor. Cian McLoughlin was National Marathon Champion in 2006, Sergiu Ciobanu was National Marathon Champion in 2009 and 2010. Under the stewardship of race director Michael Kearney Clonliffe’s biggest ever mass participation event was organised with the 2006 Dublin Port Tunnel Run when a field of 10,000 athletes ran on the soon to be opened Dublin Port Tunnel 10k race under the streets of Dublin. In 2007 Hireco Trailer Rentals became the club’s official club sponsor with the Hireco name and logo appearing on Clonliffe club singlets and tracksuits. Another important development this decade was the founding of a grants scheme for young Clonliffe athletes called the Brother Foundation. The club also promoted a number of juvenile events and introduced a very successful club Track and Field Championship day for all members: Juveniles, Seniors and Masters. Also this year the club received the recognition of Athletics Ireland by being named the Athletics Ireland Club of the Year at an inaugural awards dinner in 2007. On the 25th of July 2008 the 50th anniversary of Herb Elliot’s world mile record was marked with the holding of the Brother Morton Memorial Meeting when the biggest crowd at an Irish Athletics Meeting for a decade witnessed a superb nights athletics featuring world and Olympic champions, the highlights of which were the appearance of world Hammer Champion Betty Hydler of Germany and the Morton Mile which was won by Rob Myers (USA) in a time of 3.56.23 with a total of nine athletes running sub 4 minutes in this race. 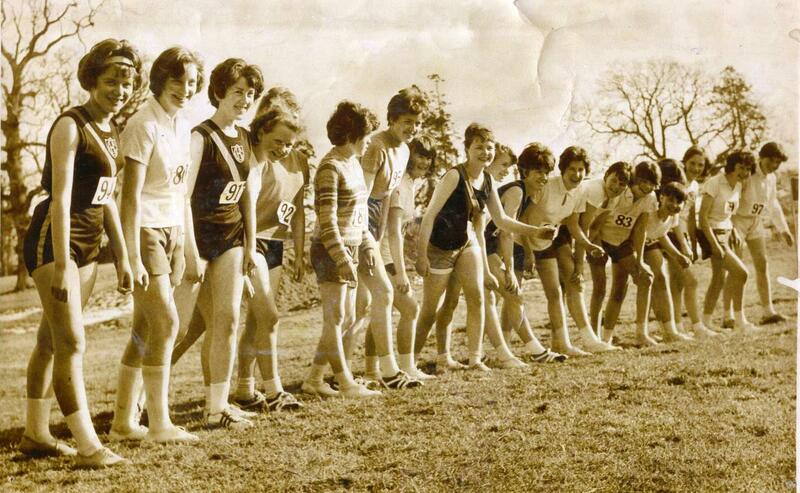 In November of 2008 the club celebrated the 45th anniversary of the founding of the Ladies Section of the club with a special 600 metre race held in Santry Demesne Parkland, this event celebrated the very first race distance competed for by the Ladies Section, and attracted members old and new back to Santry. In addition there was a 2 Mile race held in the park which attracted a substantial Ladies field. In 2009 the club lost one of it’s great servants and characters with the passing of the great Laro Byrne on the 3rd of February, however, Laro’s passing galvanised the club’s members and drew them together inspiring the club’s athletes to even greater achievement. 2009 proved to be one of the most successful years ever for the club. 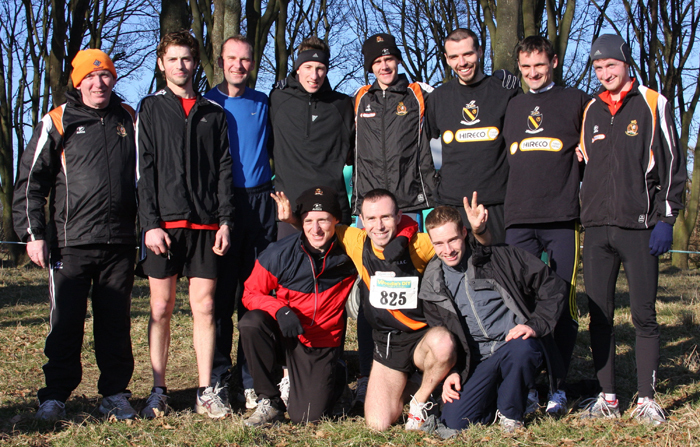 In March of 2009 the club hosted the National Cross Country once again at Santry Demesne and for the first time in 26 years the Men’s Junior Team were crowned National Champion with a scoring quartet of David Fitzmaurice, Jamie Rossiter, Eoin McDonnell and Colm Murray. 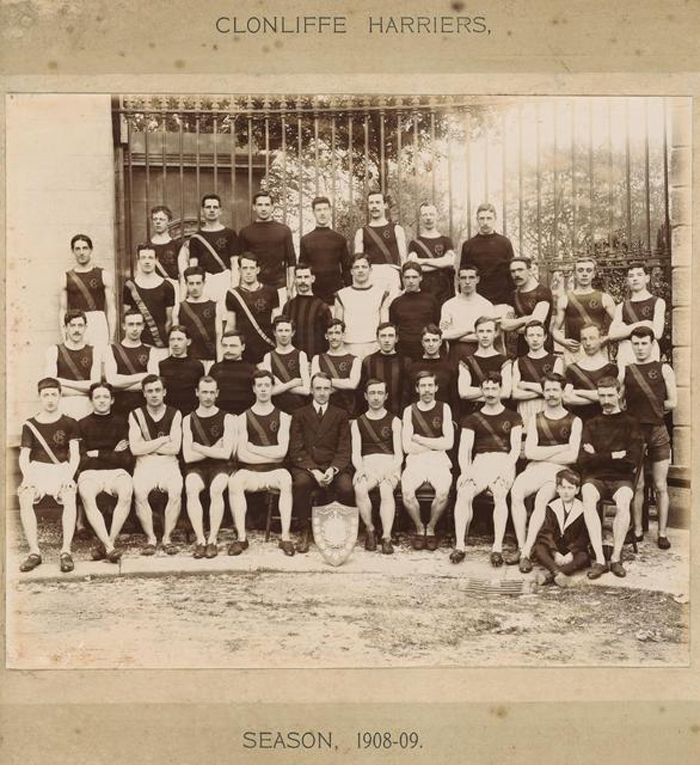 Earlier that year the club’s athletes had taken the U/19 National Title, the Senior Men also retained the National Cross Country Title and in the Summer of 2007 the Men’s Team retained their National Track and Field Championship which had been won for the first time the previous Summer. The Club also competed once again at European level at the European Club’s Cross Country which was held that year in Turkey and, for the first time, the European Club’s Track and Field Championships in Slovakia. The Ladies Section of the Club continued to grow throughout the decade with the club providing beginner’s groups, cross country groups, track and field and mountain running. The Ladies team competed with distinction in the National Track and Field league over the latter part of the decade, the team making the Division One final in 2008, in 2009 they were third (ultimately reaching the holy grade with Division One victory in 2011). The club’s Juvenile Section again continued to thrive with large numbers competing in cross country and track and field, the club’s juvenile athletes achieving great success at both County and National level and many of them going on to receive international honours. Also in 2009 as part of it’s ongoing development of the sport of athletics the club promoted the Brother at your Side School’s Cross Country, this took place in October of that year an invitational series of Cross Country races for primary schools and secondary schools which drew almost 1000 young athletes to Santry Demesne for the event which proved to be extremely popular and received universal acclimation. Clonliffe Harriers was also very much involved in the hosting of the European Cross Country Championships which came to Santry Demesne on the 13th of December 2009. Fittingly the top Irish finisher on the day was Clonliffe’s Mark Kenneally finishing a magnificent eighth position. At the end of the decade Clonliffe were the dominant club in the country winning both the National Cross Country and National Track & Field titles. The club was on a stronger footing than ever heading into 2011 and the celebration of the 125th anniversary since the club was founded in ‘Knotts Cottage’ on the Richmond Road in 1886.